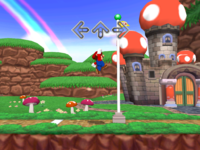 Flagpole Leap is a minigame in Dance Dance Revolution: Mario Mix, found in World 1. Mimicking Super Mario Bros., its goal is to get as high as possible on the flagpole. The player has to tap left and right alternately on the Dance Pad as fast as possible in order to make Mario or Luigi jump higher. Why do people jump on flagpoles? Why not? This page was last edited on May 25, 2018, at 19:00.